In the face of increasing numbers of refugees arriving in Europe from places such as Syria, Afghanistan and Iraq, the British Psychological Society’s Crisis, Disaster and Trauma Psychology Section held an event to inform and educate psychologists working with this population. The conference, held in London, explored the unique needs of asylum-seeking people and refugees, and the best ways to work with interpreters, and gave a real feeling of the true extent of the refugee crisis. A person with first-hand experience of the refugee camps in Greece, Dr Jenny Altschuler, who is also a clinical psychologist and family psychotherapist, set up the Refugee Trauma Initiative and spoke about migration, illness and health care. She said this was a critical issue to discuss, although in the midst of polarised debates about ‘Fortress Britain’ there seemed little space to think of ill, disabled and dying migrants. Altschuler said she felt there was insufficient attention paid to the effects of cultural and language barriers on refugees and on healthcare professionals themselves. She spoke about the ‘other’ effect, a bias towards seeing subjugated people as less worthy ‘others’, who are more open to scrutiny and regarded with suspicion. The health of refugees in camps is in jeopardy, she added: many are stuck in cramped warehouses, relying on aid, and are much more prone to communicable conditions such as flu or bronchitis. Many refugees also lack medical records, and in understaffed camps many people have to wait for hospital visits or medication over weekends or overnight. Altschuler emphasised that in working with refugees or migrants it was important to bear in mind the effects of illness or migration itself on a person as well as their sociocultural and economic context. She said we should be open in talking about a person’s journey to the UK to discover the kinds of help they would have asked for at home and their broader experience, to inform treatment in the UK. According to the 2011 census more than 138,000 people in Britain don’t speak English and around 726,000 don’t speak it very well. As a result, psychologists should be more aware of the challenges of working with interpreters in a mental health setting, said Professor Rachel Tribe (University of East London). She pointed out some of our English turns of phrase that would be very hard to translate, for example ‘I want to pick your brains’, ‘I was beside myself’, ‘the apple of my eye’ and ‘bite the bullet’. These phrases may be best avoided while working with an interpreter. As well as the many idioms of the English language, humour is also often lost in translation. Not only this, but many interpreters are open to vicarious trauma, and often are not prepared for the sorts of things discussed in a psychologist’s office. Tribe gave some advice to psychologists working with an interpreter. She said they should be aware that the dynamics of the consultation will change and should discuss the objectives of the meeting with the interpreter beforehand, and debrief them following the meeting. She added that interpreters can teach much about the differences in other cultures and languages prior to a consultation. As well as being aware of a client’s cultural background, Tribe said, it’s also vital to consider what one brings oneself to a consultation: our own biases and background play a role in every interaction. She suggested people need appropriate training for working with interpreters in a mental health setting. Tribe said that, for many refugees, speaking about psychological problems, and trusting a person in a position of authority, may be much more difficult given the countries and cultures they’ve escaped from – secrecy in many countries is a survival strategy. The research in this area is growing and, Tribe said, so far we can see that having the option to speak in one’s mother tongue is very important – perhaps particularly in a mental health setting. Many people find the experience more satisfying and positive if an interpreter is available, they may also feel better understood. Dr Anne Douglas helped to set up a Mental Health Liaison team in Glasgow that works exclusively with refugees and asylum-seeking people. This team was set up to provide advice, consultation, training and supervision across mental health services, and to input into the initial screening of newly arrived asylum-seeking people. The team, originally named Compass, also provides therapy for complex PTSD or culturally complicated problems such as the belief a person has been put under a spell. Compass, now called The Anchor, gives therapy to refugees, asylum-seeking people, and those who have been trafficked into the UK. Douglas said many of the common responses by those who are new to working with these populations are a mixture of believing they are the same as us, they are completely different, thinking they’re all traumatised or believing they all just need a nice home and a job. The best approach is somewhere in the middle: people need homes and jobs, but may also need therapy. Douglas gave some advice to those new to working with these populations. Before having a consultation one should read up on their country of origin, religion, language and common human rights abuses in that country. With those seeking asylum it is also important to know which stage of the process they are in: whether they are receiving any interim support for example. The therapy service, she added, should also be trauma-informed with a welcoming reception area and staff, including a good and appropriate interpreter, and psychologists should be aware that someone who has been imprisoned might feel more comfortable facing a window during a session. She added that it was vital to consider one’s own race, cultural background, religion and gender and how it may might affect the therapeutic relationship. The Society’s Presidential Task Force on Refugees, Asylum Seekers and Migrants, chaired by Professor Bill Yule of the Crisis, Disaster and Trauma Section, will shortly be consulting on guidance in the area. Look out for your opportunity to contribute. In other news, a team of psychologists, academics and refugees have created an online portal for asylum seekers and refugees to access a wealth of information, from mental health advice to relaxation techniques. 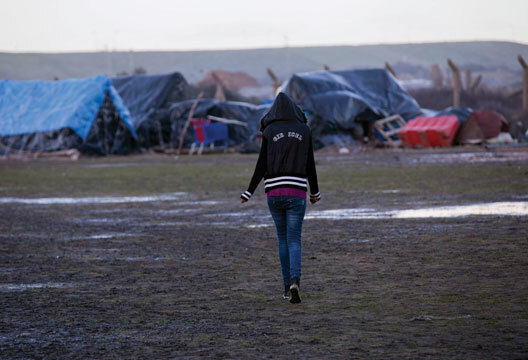 Professor Rachel Tribe (University of East London), who is leading and managing the project, spoke to The Psychologist about the origins of the portal and its value to both refugees and those working with them. Tribe, who also previously set up the Health Archive for Refugees Portal (HAPRweb) and was a member of Psychologists Working with Refugees and Asylum Seekers, said the idea for the current resource came about after a CPD workshop on working with refugees and asylum seekers. Dr Farkhondeh Farsimadan, a Chartered Psychologist with the lived experience of the phenomenon felt, in light of the number of people requiring access to information and financial cutbacks in health and social care provision, that a portal could provide a lifeline. In creating the portal Tribe and Farsimadan, both members of the British Psychological Society’s Presidential Task Force on Refugees and Asylum Seekers, also worked alongside Paul Dudman, University of East London Archivist, who provided archival support from the Refugee Council Archives. Other members included Dr Lucia Berdondini, Jidong Dung, and Dr Patricia Smith, who all made important contributions to the process, often when working in other countries. At the launch of the portal in June, BPS Vice President Professor Jamie Hacker Hughes gave a speech along with Rani Nagulandram, who spoke about her experience coming to the UK as a refugee. This work follows on from the successful civic engagement funded project in 2015 to establish the Living Refugee Archive. Developed in conjunction with the Refugee Council Archive and Dr Rumana Hashem from the UEL Centre for Migration, Refugees and Belonging, the Living Refugee Archive aims to collect life history narratives from migrants and refugees. The portal is at www.uel.ac.uk/Schools/Psychology/Research/Refugee-Mental-Health-and-Well.... Professor Tribe and Dr Farsimadan would be happy to receive suggestions of further resources or offers of translations of existing resources. If you would like to contribute, please e-mail them at [email protected] and [email protected].